BY admin IN Events & Announcements, News & Press Release Comments Off on TIBETANS! DO WE REALLY NEED A COMMUNITY? Here in the UK we all lead such fast paced and busy lives. Is there really any space to fit in a Tibetan community? Sometimes I feel that the importance of building a community with fellow Tibetans and Tibet supporters can get forgotten. Growing up in the UK since the early eighties I have witnessed so much in the growth of the Tibetan Community in the UK. Hearing my adopted Tibetan mother, who has a very modern, Western viewpoint, speaking of her efforts to build a Tibetan Community in the UK with other like minded Tibetans still echoes with me today. The year was 1985 and I was only 9 years old. Her mantras still ring true today stating why we as Tibetans should help one another and why we should “respect” our Tibetan Community. She would say “we don’t have a country”, “we are foreigners” and “we need to fully comprehend the importance of retaining our culture, identity and heritage”. It was not really until later life when reaching the big 3-0, did I really fully appreciate the complexities and intricate details of why every Tibetan should want to help and be a part of an active community. I can remember the arduous journeys from Brighton waiting for a bus, then to catch a train in order to attend the various Tibetan rallies and events scattered around London. I would often ask, why do we make such tiresome journeys for an event that only lasts 3-4 hours? My mother would always answer, “We have to Chodak, this is our duty if we really care about our community and its existence. Every single person makes a difference, especially when we are so few in number”. I took all her wise words of wisdom onboard and I knew that someday it would be fully realised. After living in the South of England for many years and being a part of the Tibetan Community, I found myself in the position of relocating to the North of England. The one thing that concerned me was the lack of a Tibetan Community in the North of the UK. I was told that no Tibetans resided in the North only in Scotland – which was way too far. After a year or so looking for Tibetan groups, support groups and communities it was apparent there were no Tibetans and just a handful of Buddhist Groups. For a while I gave up the search whilst continually checking with TCB (Tibetan Community in Britain) whether there were any Tibetans living nearby. Again I was told there were none. I thought it odd and so decided to create a Facebook page entitled Tibetans in the North to see if this would spark any interest. I made a connection with one Tibetan family in Manchester. They said that there were 2 other families in their area also. We were invited to their son’s birthday and met the other Tibetan families also. I was so pleased to meet Tibetans close to my area. It became very clear that this group of Tibetans were keen to set up a community in the North but didn’t know how to go about it. I offered my help and said that if they were serious I would be happy to spearhead this project. I was then introduced to Tibetan Kitchen who are a restaurant / takeaway in Manchester that serve beautiful Tibetan food. Bit by bit the pieces of the jigsaw puzzle started to merge together with each person saying they knew of another family close by, then another knew a family in Liverpool and the ripple effect began. I invited all of them to the Facebook page and in a month or two we had the foundations of a Tibetan community. It was very apparent to me that everyone understood the importance of a community and how much they were willing to help to make this a reality and a success. We formed a committee and set about arranging our first event – Losar (Tibetan New Year) Feb 2014. 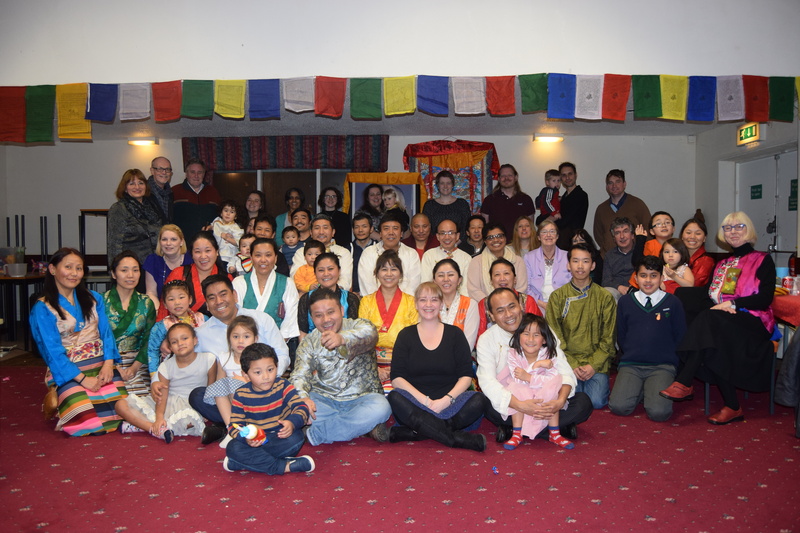 This was a great success and we were delighted to have engaged with so many Tibetans, their families, Western partners, friends and Buddhist groups. We couldn’t believe that this dream had become real and that we had lived in the North of England so close to one another for years without knowing. After this initial experience this spurred me on more than ever to ensure that no Tibetan who came to live in the North would have to go through this experience. Therefore, we created the website and opened up links with TCB (Tibetan Community in Britain) UK, The Tibet Foundation, Tibet Relief and Tibet Watch to ensure that any Tibetan arriving in the UK has a warm and welcoming community that they can be a part of. We recently launched our website www.tcbnorth.co.uk which clearly explains our vision and objectives for the group. We all value our community in the North and can truly answer YES we really do need a Tibetan Community!